WASHINGTON — Let Democrats have their way, President Donald Trump suggested, and the United States will become a country without border security, airplanes or cows. 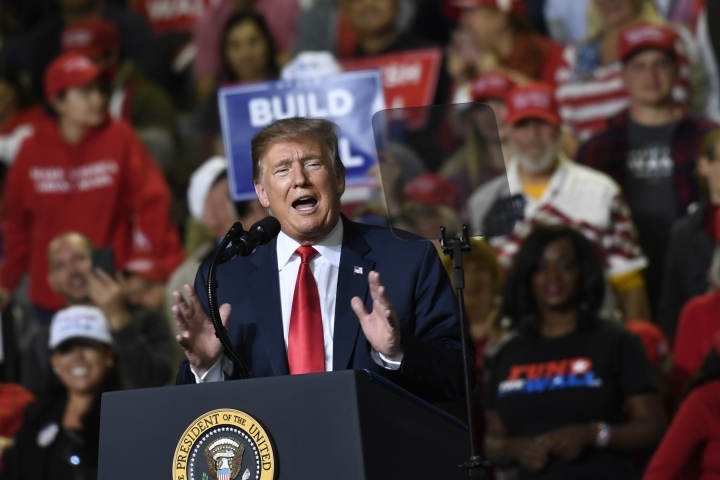 Trump warned of a variety of dire consequences from the Democratic playbook as he rallied Monday night in the border city of El Paso, Texas, in a hall where banners proclaimed "Finish the Wall" even though he barely has a start on the one he promised. 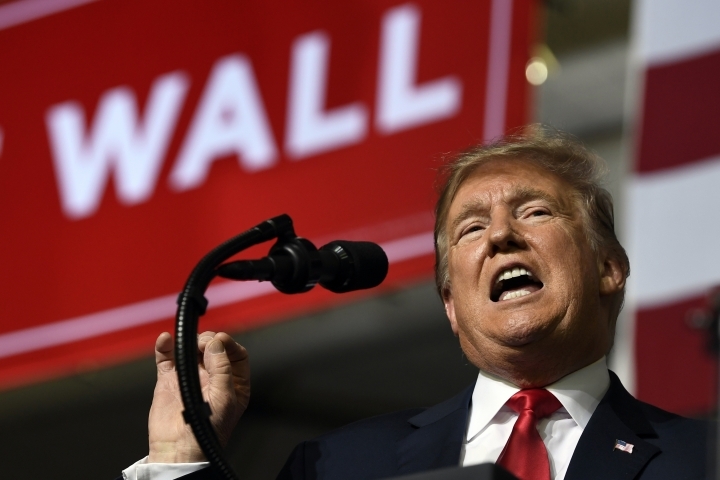 Both at the White House and in El Paso, he presented the border wall as a work in progress, hailing the start of a "big, big portion" with much more coming soon. It was a hefty exaggeration from a president who has yet to see an extra mile of barrier completed since he took office. With another government shutdown looming — a tentative agreement reached by lawmakers Monday could avert it — and illegal immigration still at the heart of the budget dispute, Trump is pulling out the stops to portray his proposed wall as an answer to crime and drugs. As he's done repeatedly, Trump also defied the record in claiming that the wall that Congress has refused to pay for is rapidly coming together anyway. TRUMP, on the effects of the Green New Deal: "You're not allowed to own cows anymore." He added that the plan would "shut down American energy" and "a little thing called air travel." THE FACTS: The Democratic plan would do none of those things. Trump chose to ignore the actual provisions of the plan, which calls for a drastic drop in greenhouse-gas emissions from fossil fuels such as oil, coal and natural gas but would not ban methane-emitting cows or air travel. Instead, Trump took his cue from a fact sheet that was distributed by the office of Democratic Rep. Alexandria Ocasio-Cortez of New York last week, then clumsily disavowed by her and replaced with a more accurate summary of the plan. The first version described measures beyond those contained in the plan, such as: "Build out high-speed rail at a scale where air travel stops becoming necessary." And it made the impolitic statement: "We set a goal to get to net-zero, rather than zero emissions, in 10 years because we aren't sure that we'll be able to fully get rid of farting cows and airplanes that fast." Corbin Trent, a spokesman for Ocasio-Cortez, said that was meant as an ironic quip. TRUMP, on the effect of a border wall on crime in El Paso: "When that wall went up, it's a whole different ball game. ... I don't care whether a mayor is a Republican or a Democrat. They're full of crap when they say it hasn't made a big difference. I heard the same thing from the fake news. They said, 'Oh crime, it actually stayed the same.' It didn't stay the same. It went way down. ... Thanks to a powerful border wall in El Paso, Texas, it's one of America's safest cities now." — rally remarks. 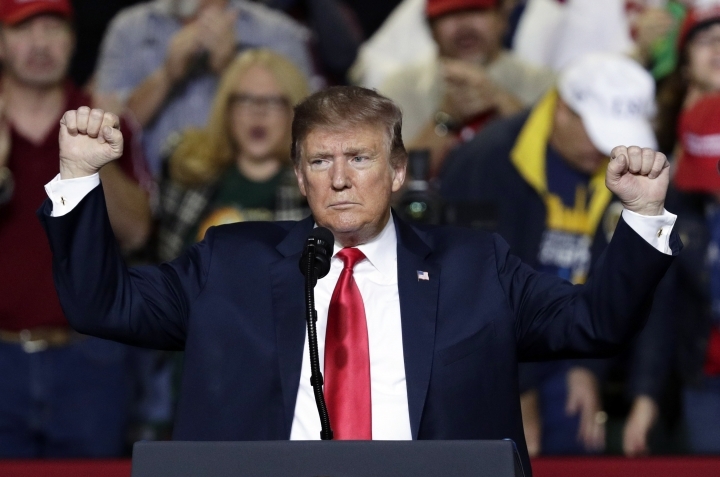 THE FACT: Trump falsely suggests a dramatic drop in crime in El Paso due to a border wall. In fact, the city's murder rate was less than half the national average in 2005, the year before the start of its border fence. It's true that the FBI's Uniform Crime Report shows that El Paso's annual number of reported violent crimes dropped from nearly 5,000 in 1995 to around 2,700 in 2016. But that corresponded with similar declines in violent crime nationwide and included periods when the city's crime rates increased year over year, despite new fencing and walls. TRUMP, on his proposed wall: "We've built a lot of it." — rally remarks. TRUMP: "We've actually started a big, big portion of the wall today at a very important location, and it's going to go up pretty quickly over the next nine months. That whole area will be finished. It's fully funded ... and we're going to have a lot of wall being built over the next period of time." — White House remarks. THE FACTS: There's less going on here than his words convey. Construction is getting started on merely 14 miles (23 kilometers) of extended barrier, approved by Congress about a year ago in an appropriation that also authorized money to renovate and strengthen some existing fencing. The extension will be in Texas' Rio Grande Valley. That's not a "big, big portion" of the grand project he promised in his campaign and countless times since — a wall that, combined with existing fencing and natural barriers, would seal the nearly 2,000-mile (3,200-kilomete) border with Mexico. TRUMP, on preparations for his rally: "We have a line that is very long already. I mean, you see what's going on. And I understand our competitor's got a line, too, but it's a tiny little line." — at the White House. THE FACTS: That's not true. 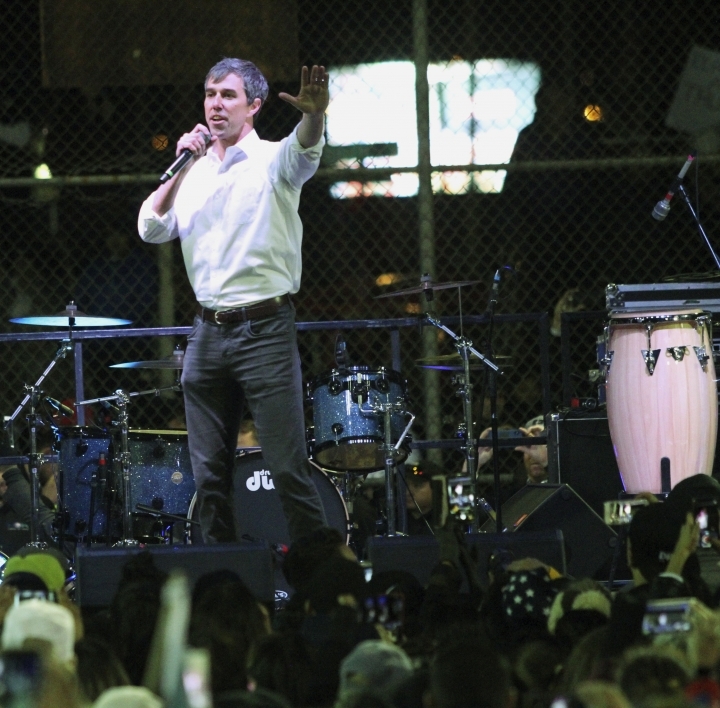 His comment came about four hours before his El Paso rally and a competing one nearby, led by Beto O'Rourke, a prospective Democratic presidential contender. The gathering for both events was small at the time. People were standing around in a dusty wind, not so much lined up. 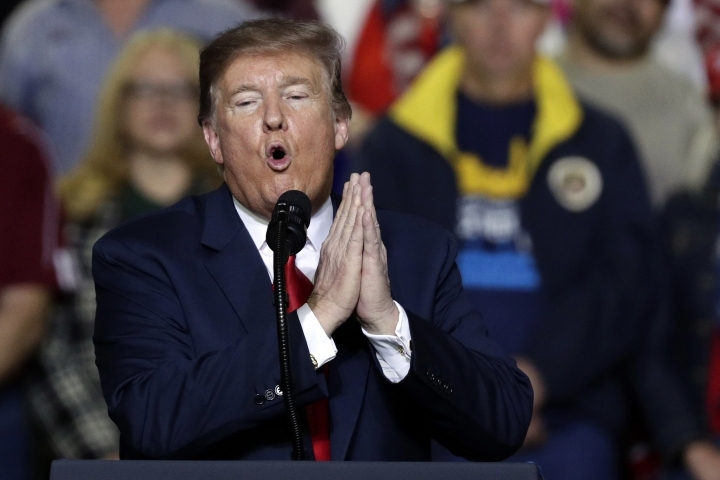 TRUMP, addressing El Paso rally: "He has 200 people, 300 people, not too good. ... That may be the end of his presidential bid." THE FACTS: That's not true, either. O'Rourke's march and rally drew thousands. Police did not give an estimate, but his crowd filled up nearly all of a baseball field from the stage at the infield to the edge of outfield and was tightly packed. TRUMP: "Drugs pouring through the border kills tens of thousands of innocent Americans a year, including heroin, meth, cocaine, fentanyl, so many others — they come through the southern border. We have a drug problem over the last 6, 7, 10 years like we have never had before. We can have such a big cut in the numbers, the percentages, if we get the wall built." — rally remarks. THE FACTS: His assertion that a wall would stop most drugs from "pouring" into the U.S. runs counter to his government's findings on how the illegal substances get in. Most of it is smuggled through official border crossings, not remote stretches of the border. The Drug Enforcement Administration says "only a small percentage" of heroin seized by U.S. authorities comes across on territory between ports of entry. The same is true of drugs generally, with the exception of marijuana. TRUMP: "Illegal immigration hurts all Americans, including millions of legal immigrants, by driving down wages, draining public resources and claiming countless innocent lives." — rally remarks. THE FACTS: These assertions are unsupported by research, which Trump appeared to acknowledge obliquely by making a crack about "phony stats." The weight of research on wages suggests that immigrants have not suppressed them, although it's not cut and dried. What's clear is that macro forces that go beyond immigration are at work in the sluggishness of wage growth: the decline in unionization, an intensified push to maximize corporate profits, growing health insurance costs that supplant wages and the rise of a lower-wage global labor force that in an intertwined worldwide economy can hinder pay growth for Americans. On public resources, the National Academy of Sciences concluded: "An immigrant and a native-born person with similar characteristics will likely have the same fiscal impact." The academy found that because state and local governments supply most of the money for public schools, immigrants often receive more in benefits than they pay in taxes. But education produces children who grow into adults who get jobs, buy cars, buy houses and pay taxes and thereby contribute to economic growth. And succeeding generations of immigrant families become net contributors to government budgets, according to the study. TRUMP: "We're going to El Paso. ... We're going there to keep our country safe, and we don't want murderers and drug dealers and gang members, MS-13, and some of the worst people in the world coming into our country. ... We need a wall." — remarks at White House. Associated Press writers Will Weissert in El Paso, Texas, Elliot Spagat in San Diego and Kevin Freking, Michael Balsamo and Matthew Daly in Washington contributed to this report.